Powers/Abilities: Bloodmace was exceptionally strong for a normal human, but possessed no superhuman powers - unless you count the uncanny ability to name yourself after whatever weapon you're carrying around at the time a power... He also had one heck of a glass jaw. History: (Spider-Man 2099#14-bts) After Spider-Man defeated a small group of Fenris harassing Father Jennifer, one of the members claimed that Bloodsword would get revenge for them. (Spider-Man 2099#15) Getting into another fight with the Fenris, Spider-Man was confronted by their leader, Bloodsword, who threatened him. Bloodsword charged Spider-Man, swiping at him with his sword, but Spider-Man caught it with his hands. Using his talons, Spider-Man cut the sword into pieces, then punched Bloodsword out. (Spider-Man 2099#17-fb) Some members of the Fenris began to believe that Bloodsword was weak, after his defeat at the hands of Spider-Man. Fenris Lieutenant Hogun challenged Bloodsword to a fight to the death, but as they were still circling, Alchemax's Thor's hammer fell from the sky, landing directly on Hogun, squashing him. Believing this to be an act of god, Bloodsword took the hammer, and changed his name to Bloodhammer. 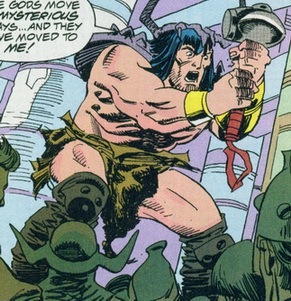 (Spider-Man 2099#17) Bloodhammer had commanded a large crowd of people, including Miguel O'Hara's mother, Conchata. Miguel came to take her back to the home, but she yelled out. Bloodhammer demanded Miguel explain himself. Miguel told Bloodhammer that his mother was a sick woman and needed to be taken back to the home, and Bloodhammer agreed that it was a fair request.. But ordered Miguel to be killed anyway. Bloodhammer had Miguel hung upside down by his feet, and ordered the crowd to pray before the pummelling would commence. While nobody was paying attention, Miguel used his talons to slice the ropes up, dropping himself to the ground. The crowd was shocked, but Miguel told them that Thor had answered his prayers. Bloodhammer was angered, and charged Miguel with the hammer. Miguel caused a distraction ("Look! Up there!! IT'S THOR!! "), and when nobody was looking, punched Bloodhammer out again. The crowd began to riot, but Miguel and Conchata escaped the carnage. (Spider-Man 2099#35) Having hit hard times, Bloodmace had lost his position in the Fenris after his embarrassing defeat as Bloodhammer. Sitting with another Fenris member, Bloodmace discussed Tyler Stone's shooting, but was confronted by Venom 2099. Bloodmace once more jumped to attack without thinking, and the Venom symbiote swallowed him up, leaving nothing but bones in it's wake.